This week we are going to organize UNO tournament. Here are the rules: each player must match a card from his hand to the card on the top of the pile, either by number, color or symbol. But some cards have special powers, such as reversing the direction of play, skipping the turn of the next player or making him draw up to four cards! The first player to get rid of all his cards wins the round and gets points from the cards his opponents are left holding. 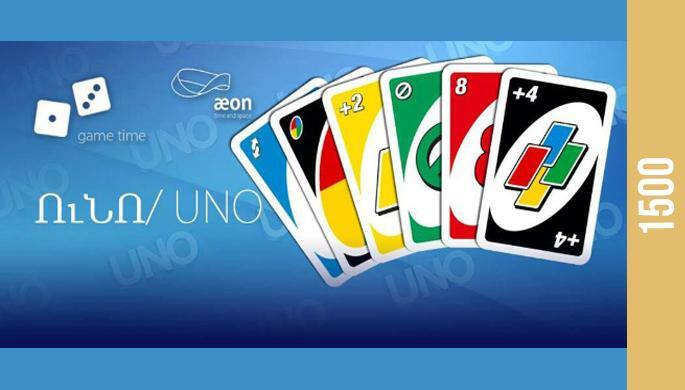 The game will take place in several phases, at the end will be one winner who will receive a surprise gift from AEON. Entrance is 1500 AMD including tea, coffee, sweets.